Macca (aka Kev) an Oxford born bass player, began playing at age 6 years old wanting to be a musician just like his big brother Eric who emigrated to the States. He played his first public gig aged 15 and when he left school one of his first jobs was working back stage at the New Theatre where he met many of his idols such as Phil Lynott from Thin Lizzy. 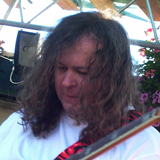 He has played in many local bands over the years and depped for many including Mr Bigg. Some musical influences include Jaco Pastorius, Flea, Bootsey Collins, Geddy Lea, Phil Lynott to name a few. Equipment: Too many bass guitars to mention, but favourites include Fender Jazzes, Music Mann Stingrays, Mark Bass Amp and head, various effect pedals, Shure Beta mic. Likes: Cats, bunnies, going to the cinema, Dr Who, Superhero movies, being laid back and happy, making music, teaching music, being engaged to lead singer Mary Anne (Mary Anne wrote that!). Dislikes: Rushing about, technology that doesn't work for whatever reason, egotistical people.